As this post goes live, there are only 65 shopping days left until Christmas! WHAT?! That freaks me out a little! Those of you who have already started shopping – you are my heroes. I don’t know how you can be that organized. Seriously. I’m one of those people who is running to the post office on the last day to ship by Christmas and frantically wrapping gifts on Christmas Eve. But this year can be different! Probably not for me. But maybe for you! 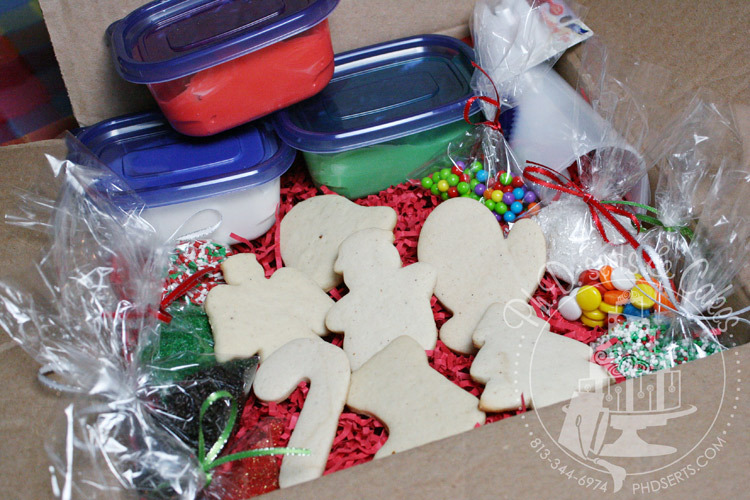 A couple of years ago, I developed a cookie decorating kit that is fully stocked with everything you need to make your holiday cookies beautiful. It’s perfect for family gifts, and I love it because it buys me a few minutes of peace on a busy day. Country chic and vintage is in! I think the only way you might have missed that is if you’ve been living under a rock. Just teasing. But lace details, rustic elegance, shabby chic…they’re all the rage right now. So when Chloe turned 18 (remember Chloe’s 16th birthday cake? ), that’s what she wanted! She chose a cake inspired by the Lilly Pulizer First Impression pattern. Many people across the nation are starting to feel the cooler weather of Fall, but in Florida, ice cream is always in season! So here are some quick ice cream cone cookies for your Wednesday! Which of the classic flavors do you like best – strawberry, vanilla, or chocolate? Or maybe a scoop of each??? Ph.D.-serts specializes in cookies, cakes, treats, groom’s cakes, wedding cakes and treats for Tampa, FL and surrounding areas including but not limited to Wesley Chapel, Lutz, Land O’ Lakes, Brandon, Lakeland, Pasco County and Hillsborough County. Here’s a quick post for your Wednesday! Batman cookies made for a first birthday party. Pow! Bam! Who doesn’t love classic Batman?! You meet a lot of interesting people in the cake decorating world. Some people stumble into cake decorating and stay for years and years, passionate about creating edible, decorated masterpieces. Others find themselves following other paths – like food blogging or food photography or gourmet desserts. One of my friends recently found herself buying and launching a food truck! Wow! She designed the wrap for the truck and I must say it looks amazing! Love the pink and black zebra print swirly thing along the top and bottom. The design is really eye-catching and stands out at a food truck rally. It’s summertime! How ’bout some swimsuit cookies for your next beach party??? We love helping families break the news about pregnancies to their families. Usually, the big reveal is whether the baby is a boy or girl, but a few months ago, we were able to help a future Mommy tell her family that she was pregnant! Did you see the latest Gender Reveal Cake we posted on Facebook? One of Mel’s good friends just announced her pregnancy and wanted to reveal the gender of the baby among a small group of friends. While she wants to remain anonymous until she can contact all her friends and family, we just can’t leave you hanging. Here’s the big reveal moment!! !